There are some species that have been very little studied, due to their location. An example of this is the Spangled Kookaburra, one of the least known species. But what about her? Do they have any other names? Its scientific name is dacelo tyro, and is commonly known as Spangled Kookaburra. It is a Coraciform bird of the family Halcyonidae, and lives in New Guinea and the Arus Islands. Unlike other family members who tend to prefer to live in deeper forest areas, this species lives in the coastal areas of its habitat, in forested areas close to large water sources. It is not a species that stands out too much for any particular characteristic. It is 33 cm long and has no sexual dimorphism, although the female is slightly larger than the male. Its head and neck are black, with white speckles, a colour that extends to the upper back. Its wings and tail are bright blue, characteristic of kookaburras. His chest and belly are white. The upper half of the bill is dark grey, while the lower half is whitish. Dacelo tyro archboldi: This one lives in the south-central zone of New Guinea. Dacelo tyro tyro: It is exclusive to the island of Aru. What is known about their life in freedom? As has been said before, it is a species of which there is very little information about his life in freedom. They seem to prefer to live in savannahs or shallow wooded areas, as long as they are close to the water for easy access to water and food. The diet is usually composed of insects, such as bees, ants and some winged insects with antennae. 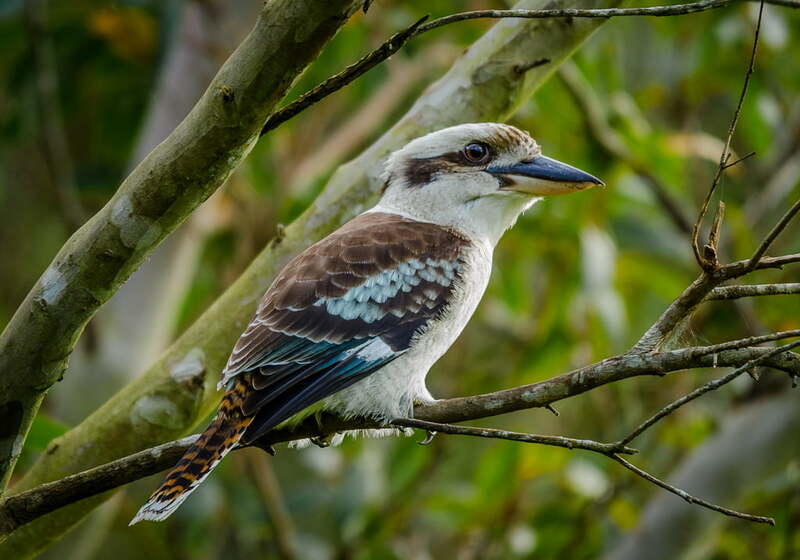 Unlike other kookaburras, it is very rare to see them eating other types of birds or mammals. Their reproduction could take place in March, almost by the end of the month. Especially in the youngest specimens. The female, once fertilized, would be in charge of finding a place to lay the nest. As a rule this will be found in a tree hole. The laying can be between 3-5 eggs, and will incubate them for three weeks until the chicks hatch. The father’s task in this process seems to be to be the watchdog, while the female will be the incubator throughout the process until the young leave the nest.